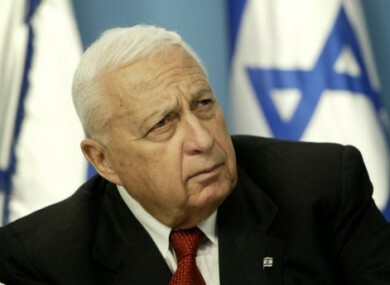 2004 photo of Ariel Sharon during a news conference in Jerusalem. Sharon has been in a coma for nearly eight years but his condition worsened yesterday according to Israeli media. The 85-year-old, who is at the hospital in the city of Tel Aviv, was suffering from “serious kidney problems” after undergoing surgery, army radio said. The long-time leader of the right-wing nationalist camp in Israeli politics suffered a massive stroke in January 2006 before slipping into a coma from which he has never recovered. He was first elected prime minister in February 2001, just months after walking through east Jerusalem’s flashpoint Al-Aqsa mosque compound, revered by Jews as the Temple Mount, in an action that sparked the second Palestinian uprising. Explainer: What do the Israeli-Palestinian peace talks mean? Email “Vital organs of former Israeli PM Ariel Sharon are failing says Tel Aviv hospital”. Feedback on “Vital organs of former Israeli PM Ariel Sharon are failing says Tel Aviv hospital”.